Here's how to use our electricity retailer comparison tool to see if other retailers can get you a better deal on your electricity - based on numbers taken from your recent electricity bills. You can do this whether you have solar or not - but this particular tool has been designed for solar owners specifically. The idea is that you dig out a recent bill, then you can use your actual solar exports and grid imports to calculate what that bill would have been with all the other retailer who sell electricity in your area. Here I will be using my friend Michael's bill. He has a solar system and quite high usage. He has not compared retailers recently so this should be interesting. When I click the green button - I find a very loooooooong list of retail plans! And wow, the cheapest plan, according to the tool is almost half the price of Michaels's existing retailer. So what I will be advising him is to call up one of the better deals in the list and double check that he's eligible for that plan and that the rates are as advertised. If everything checks out he can almost half his bill by switching. If he's not comfortable with the more obscure retailers like 'Amaysim' he may want to pay a little bir more for a household name like Origin. His call. Another good strategy - is to call up his existing retailer and tell then that he's about to switch unless they put him on their absolute best deal. I did this with AGL and got 17% off my bills immediately! A note about commissions: The functionality of this tool is provided by Mozo. We use some custom code to make it as useful as possible for solar owners. As you can see - most plans say 'direct link not available'. This means the retailer does not have a commercial agreement with Mozo and does not pay commissions to them for being in the tool. 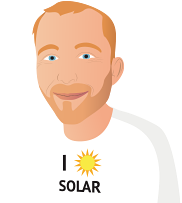 Only if you click a green 'Go to site' button on a 'Promoted Plan' and sign up for the plan will Mozo get a commission which they share with us as SolarQuotes®. We don't actually provide this tool primarily to make money (we make a few hundred bucks a month from it if we are lucky!). We provide it because we honestly think it is the easiest way for solar owners to compare flat rate electricity plans. I hope it is useful to you. How can I protect my solar power system from lightning strikes?